I’ll kick off the new RG season with a twofer, two grand, relatively new, semi-dwarf evergreens from a genus that continues to evolve and delight: Arborvitae. Sunkist is a semi-dwarf variety that will grow moderately (6-8” per year) to a height of 10’ or more. Unabated, width can approach 8’. 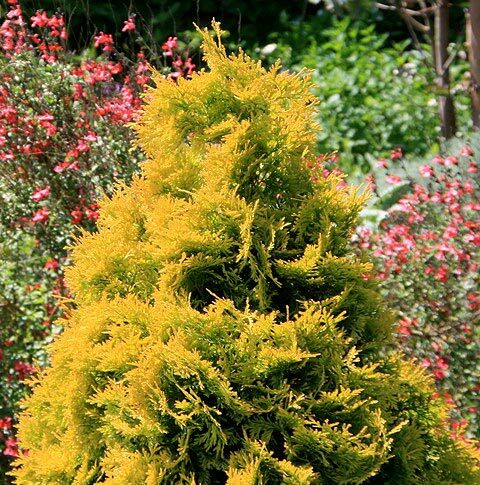 Think of it as a more blousy, irregular, broad-shaped yellow arborvitae than the relatively compact and pyramidal ‘Yellow Ribbon.’ Foliage also lays flatter, in whorls, holding medium green interior color with pronounced gold-yellow new growth in spring and summer. The color dulls a bit toward dusty orange-yellow in winter, but remains striking in the winter landscape. Sunkist is useful, therefore, in larger landscapes where you wish to create a prominent, background glob of golden yellow. Shearing in late spring, after new growth has stretched out a bit, then again in mid-summer, will keep the plant from developing its inherent, upright globular form, but why? You plant it for this eventual, billowy form. 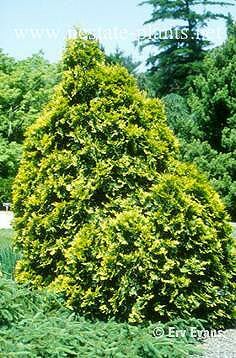 Useful as a screening shrub, though for a formal to semi-formal yellow hedge in the 10 to 12-foot range, I’d use Yellow Ribbon arborvitae instead. Sunkist loves a mildly acidic soil, but does well in alkaline soils up to pH 8. Soil should be well drained. All arborvitae appreciate regular watering and spring fertilization. Full sun is best, though part sun with at least four hours of direct sunlight will suffice. Tolerant of black walnut trees, avoid drying winter winds. Zones 3-7. 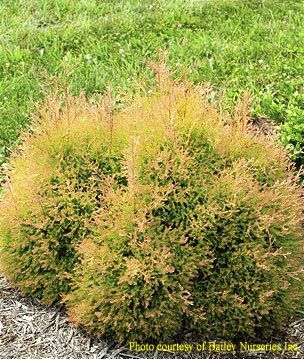 Fire Chief™ is a sport of Thuja occidentalis ‘Rheingold’ that was developed by one of America’s premier plant breeding companies, Pennsylvania’s Conard-Pyle Co., creator of the Knock Out® family of shrub roses. How do you know when a nursery company is premier? The company’s origin dates back to the Dingee & Conard Co., founded in 1800. What’s with the ‘Congabe’ licensed name and patent number noted above? Whenever you see a trade name followed by a patent number, it means it’s very, very naughty to propagate this plant on your own, for any use whatsoever.Saving the best for second here, this is one of the newest arborvitae and the first to give us new growth tip color in the reddish-plum vein. New growth stems are also reddish-plum. It’s eye-popping, in a dwarf semi-globe form, achieving a mature height of 4’ tall by 4’ wide (to the best of anyone’s knowledge). Plants in trials in the north have shown no winter burn. Red foliage mellows to various levels of orange and peach as the season progresses. Winter color ranges from bright orange to dusty red. Plants reject the usual look of arborvitae foliage; as with Thuja ‘Mr. Bowling Ball,’ foliage more resembles that of a fine-textured juniper or chamaecyparis. Plant Fire Chief™ in foundation beds, in front of taller deciduous shrubs, as a structure plant within the perennial garden, or anyplace it can be seen readily. This is a great shrub to use as a repeating dash in the front or middle of an extended landscape bed. Its more petite size makes it a welcome addition to smaller yards. It can be sheared into a perfect ball, but if that’s your thing, you’ve fallen in love with the wrong website; I’d prefer you allow the multiple leaders to grow so that it retains its natural, irregular shape. Give it full sun, at least six hour of direct sunlight per day. Reddish color intensifies in full sun exposure. Soil should be average, acidic to mild alkaline, soil that drains well heartily recommended. Regular weekly watering and spring fertilization keep it trouble-free. Plants are resistant to winter burn, not the first choice of deer, and Japanese beetles don’t know they exist. Zones 3-7.